Papers are listed in English by language. Any and all papers on transmathematics that are brought to our attention will be listed. Just email the bibiographic details in English, together with a URL of the paper. If the paper is not in English, please also include an English translation of the title. No warrant is given to the correctness of papers. This is simply a record of publications. The on-line papers listed here are sometimes accompanied by presentations and downloads. Downloads holds a full list of downloadable software, movies, and pictures. Many of the on-line papers refer to papers that were not published on line. These can be accessed from a library or, perhaps, from the digitised versions of a library's stock. J. A. D. W. Anderson "Exact Numerical Computation of the Rational General Linear Transformations" in Vision Geometry XI, Longin Jan Lateki, David M. Mount, Angela Y. Wu, Editors, Proceedings of SPIE Vol. 4794, 22-28 (2002). Accompanied by the presentation given at the conference. J. A. D. W. Anderson, "Perspex Machine" in Vision Geometry XI, Longin Jan Lateki, David M. Mount, Angela Y. Wu, Editors, Proceedings of SPIE Vol. 4794, 10-21 (2002). Accompanied by the presentation given at the conference. J. A. D. W. Anderson "Robot Free Will" in F. van Harmelan (ed) ECAI 2002. Proceedings of the 15th European Conference on Artificial Intelligence pages 559-563, IOS Press, Amsterdam, 21-26 July, (2002). Accompanied by the presentation given at the conference. J. A. D. W. Anderson "Perspex Machine II: Visualisation" in Vision Geometry XIII, Longin Jan Lateki, David M. Mount, Angela Y. Wu, Editors, Proceedings of SPIE Vol. 5675, 100-111 (2005). Accompanied by the presentation given at the conference, And a software download. J. A. D. W. Anderson "Perspex Machine III: Continuity Over the Turing Operations" in Vision Geometry XIII, Longin Jan Lateki, David M. Mount, Angela Y. Wu, Editors, Proceedings of SPIE Vol. 5675, 112-123 (2005). Accompanied by the presentation given at the conference, And a software download. James Anderson, Matthew Spanner, Christopher Kershaw "Perspex Machine IV: Spatial Properties of Computation" in AISB Quarterly, pp 8,10, no. 121 (2005). M. P. Spanner & J. A. D. W. Anderson "Perspex Machine V: Compilation of C Programs" in Vision Geometry XIV, Longin Jan Lateki, David M. Mount, Angela Y. Wu, Editors, Proceedings of SPIE Vol. 6066 (2006). Accompanied by the presentation given at the conference. C. J. A. Kershaw & J. A. D. W. Anderson "Perspex Machine VI: A Graphical User Interface to the Perspex Machine" in Vision Geometry XIV, Longin Jan Lateki, David M. Mount, Angela Y. Wu, Editors, Proceedings of SPIE Vol. 6066 (2006). Accompanied by the presentation and the poster given at the conference. J. A. D. W. Anderson "Perspex Machine VII: The Universal Perspex Machine" in Vision Geometry XIV, Longin Jan Lateki, David M. Mount, Angela Y. Wu, Editors, Proceedings of SPIE Vol. 6066 (2006). Accompanied by the presentation and the poster given at the conference. J. A. D. W. Anderson, Norbert Völker, Andrew A. Adams "Perspex Machine VIII: Axioms of Transreal Arithmetic" in Vision Geometry XV, Longin Jan Lateki, David M. Mount, Angela Y. Wu, Editors, Proceedings of SPIE Vol. 6499 (2007). Accompanied by a machine proof and the presentation	given at the conference. Also a derived presentation given to launch Angle's technology transfer relationship with the University of Reading. Also a derived presentation given at Blue Fusion 2007. J. A. D. W. Anderson, "Perspex Machine IX: Transreal Analysis" in Vision Geometry XV, Longin Jan Lateki, David M. Mount, Angela Y. Wu, Editors, Proceedings of SPIE Vol. 6499 (2007). Accompanied by the presentation	and the poster given at the conference. And a derived presentation given to launch Angle's technology transfer relationship with the University of Reading. J. A. D. W. Anderson, "Perspex Machine X: Software Development" in Vision Geometry XV, Longin Jan Lateki, David M. Mount, Angela Y. Wu, Editors, Proceedings of SPIE Vol. 6499 (2007). Accompanied by the poster given at the conference. J. A. D. W. Anderson, "Perspex Machine XII: Transfloating-point and transcomplex arithmetic with applications in mathematical physics" 5 Nov. 2010, unpublished manuscript. Accompanied by source code and documentation. J. A. D. W. Anderson, "Evolutionary and Revolutionary Effects of Transcomputation" Oct. 2011, in 2nd IMA Confrence on Mathematics in Defence, Defence Academy of the United Kingdom, Shrivenham, England. ISBN 978 0 905091 29 7. Accompanied by a poster. This is all that has been published from the Perspex Machine XII paper. See the above source code and documentation for an implementation of transcomplex arithmetic. J. A. D. W. Anderson, "Trans-Newtonian Physics Operates at Singularities" First completed March 2013, first archived February 2014. J. A. D. W. Anderson, "Transvector Algebra and Analysis Operate at Singularities" First archived April 2014. J. A. D. W. Anderson, "Trans-Floating-Point Arithmetic Removes Nine Quadrillion Redundancies From 64-bit IEEE 754 Floating-Point Arithmetic" in World Congress on Engineering and Computer Science 2014, San Francisco, USA, 22-24 October 2014, vol 1, pp. 80-85, ISBN: 978-988-19252-0-6, ISSN 2078-0958. With a presentation that advances on the paper and a summary of all five papers presented at the conference. ERRATA: There are some typos in the paper. In every truth table, r_1 in the heading row should be r_2. In the not-equal table, the last row should be: T, T, T, F. These errors are corrected in the presentation. J. A. D. W. Anderson & T. S. dos Reis, "Transreal Limits Expose Category Errors in IEEE 754 Floating-Point Arithmetic and in Mathematics" in World Congress on Engineering and Computer Science 2014, San Francisco, USA, 22-24 October 2014, vol 1, pp. 86-91, ISBN: 978-988-19252-0-6, ISSN 2078-0958. With a presentation that advances on the paper, video, and a summary of all five papers presented at the conference. T. S. dos Reis & J. 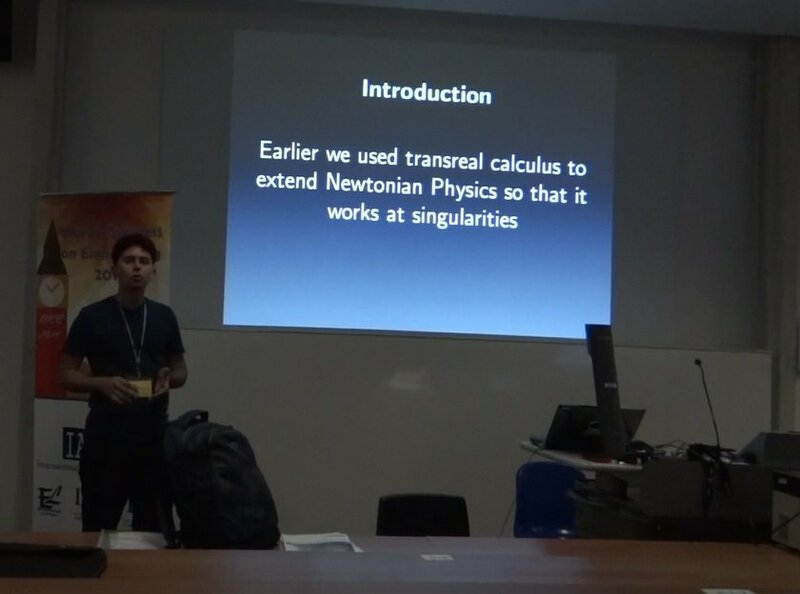 A. D. W. Anderson, "Transdifferential and Transintegral Calculus" in World Congress on Engineering and Computer Science 2014, San Francisco, USA, 22-24 October 2014, vol 1, pp. 92-96, ISBN: 978-988-19252-0-6, ISSN 2078-0958. With a presentation that advances on the paper, a video of the presentation, a video of questions, and a summary of all five papers presented at the conference. T. S. dos Reis & J. A. D. W. Anderson, "Construction of the Transcomplex Numbers from the Complex Numbers" in World Congress on Engineering and Computer Science 2014, San Francisco, USA, 22-24 October 2014, vol 1, pp. 97-102, ISBN: 978-988-19252-0-6, ISSN 2078-0958. With a presentation that advances on the paper, a video, and a summary of all five papers presented at the conference. J. A. D. W. Anderson & W. Gomide, "Transreal Arithmetic as a Consistent Basis for Paraconsistent Logics" in World Congress on Engineering and Computer Science 2014, San Francisco, USA, 22-24 October 2014, vol 1, pp. 103-108, ISBN: 978-988-19252-0-6, ISSN 2078-0958. With a presentation that advances on the paper and a summary of all five papers presented at the conference. W. Gomide, T. S. dos Reis, J. A. D. W. Anderson, "Transreal Proof of the Existence of Universal Possible Worlds" an abstract in Handbook of the 5th World Congress and School on Universal Logic Instanbul, Turkey, pp. 324-324, June 25-30, 2015. T. S. dos Reis & J. A. D. W. Anderson, "Transreal Calculus" IAENG International Journal of Applied Mathematics, v. 45, n. 1, p. 51-63, 2015. T. S. dos Reis & J. A. D. W. Anderson, "Transreal Limits and Elementary Functions" in Haeng Kon Kim; Mahyar A. Amouzegar; Sio-long Ao. Transactions on Engineering Technologies, World Congress on Engineering and Computer Science 2014. London: Springer, pp. 209-225, 2015. W. Gomide, J. A. D. W. Anderson & T. S. dos Reis "Transreal Logical Space of All Propositions" in Haeng Kon Kim; Mahyar A. Amouzegar; Sio-long Ao. Transactions on Engineering Technologies, World Congress on Engineering and Computer Science 2014. London: Springer, pp. 227-242, 2015.
vol. 51, pp. 1828-1837, 2015. T. S. dos Reis, W. Gomide & J. A. D. W. Anderson, "Construction of the Transreal Numbers and Algebraic Transfields" IAENG International Journal of Applied Mathematics, vol. 46, no. 1, pp. 11-23, 2016. J. A. D. W. Anderson & T. S. dos Reis, "Transreal Newtonian Physics Operates at Singularities" in Synesis, vol. 7, no. 2, Dec 2015. ISSN 1984-6754. T. S. dos Reis & J. 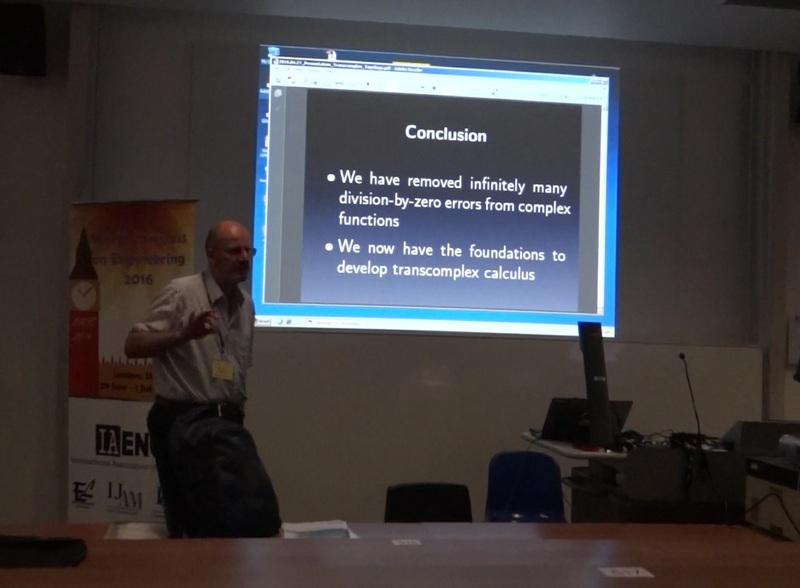 A. D. W. Anderson, "Transcomplex Topology and Elementary Functions," World Congress on Engineering 2016, London, 29 June - 1 July, eds. S. I. Ao, Len Gelman, David W. L. Hukins, Andrew Hunter, A. M. Korsunsky, publisher International Association of Engineers, pp. 164-169, 2016. Accompanied by a presentation, photographs of Tiago and James, video of Tiago and James and Questions. J. A. D. W. Anderson, Draft papers on extending set theory and a presentation given at Reading University on 23 November, 2016. Walter Gomide & Tiago S. dos Reis, “NÚMEROS TRANSREAIS: SOBRE A NOÇÃO DE DISTÂNCIA” or “TRANSREALNUMBERS: ON THE CONCEPT OF DISTANCE” in Synesis, v. 5, n. 2, p. 197-210, jul/dez. 2013, ISSN 1984-6754. T. S. dos Reis, W. Gomide & R. S. Kubrusly, “NÚMEROS TRANSREAIS. MAIS UMA ETAPA NA HISTÓRIA DOS NÚMEROS" or "Transreal numbers: one more step in the history of numbers" in Scientiarum History: VI Congress of History of Science, Technical and epistemology, Federal University of Rio de Janeiro, 2013. T. S. dos Reis “NÚMEROS TRANSREAIS: MATEMÁTICA OU DEVANEIO?" or "Transreal numbers: mathematics or reverie?" Os Números dos Mundos, 14º Seminário Nacional de História da Ciência e da Tecnologia, Belo Horizonte, Campus Pampulha da Universidade Federal de Minas Gerais – UFMG 08 a 11 de outubro de 2014 | ISBN: 978-85-62707-62-9. T. S. dos Reis & R. S. Kubrusly "Divisão por zero e o desenvolvimento dos números transreais" or "Division by zero and the development of the transreal numbers" Synesis, v. 7, n. 1, p. 139-154, 2015. ISSN 1984-6754. To have your transmathematics paper listed here, email the bibilographic details and a URL of the paper. If your paper is not in English then please also give an English translation of the title.